For a while now I've been looking for a more natural skincare brand, something without anything artificial which could affect my skin. I had no idea the amount of products that contain everything from plastic (actual plastic - what!) to parabens and coal tar, and figured out that one of the reasons for my regular breakouts could be connected to putting this stuff on my face. But it can be difficult to find a natural routine that feels like it actually works. At this point I feel as though I've been through just about every natural skincare brand I could find, and although I've found some fantastic products, I was still looking for that one brand where everything worked. 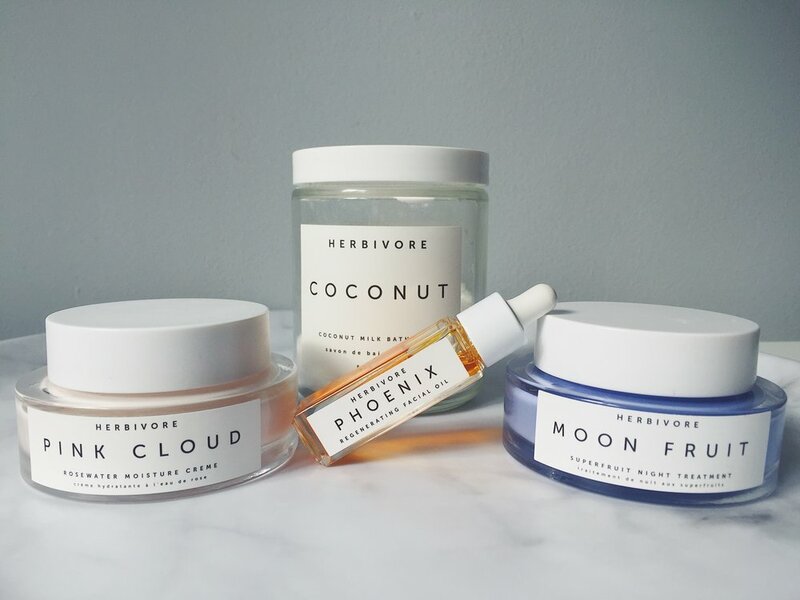 Herbivore Botanicals are one of Space NK's newest launches to the UK. 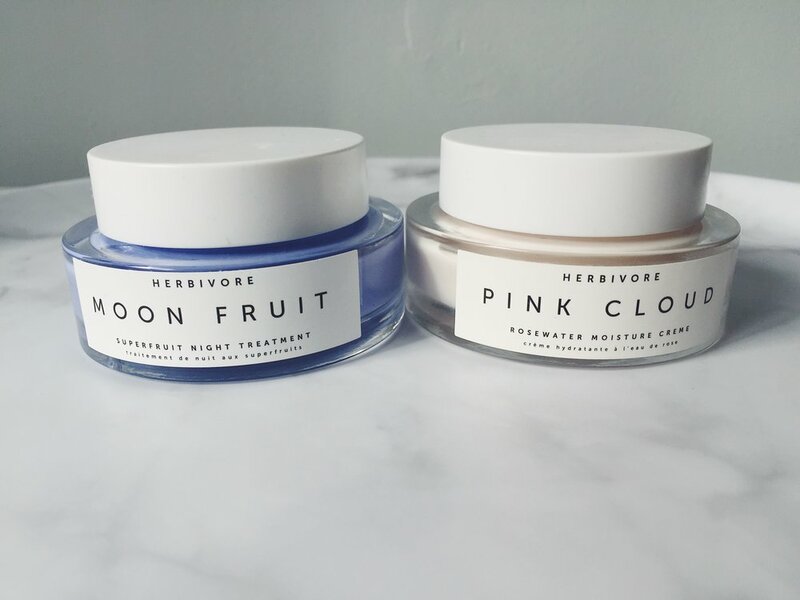 Hailing from America, Herbivore comes from a husband and wife team who source the most natural, non toxic products possible with looooooads of active ingredients. Basically, it was a brand I was desperate to try the minute I saw the launch, and had myself a little Space NK session. I decided to go for a full skincare routine, with a day cream, night mask and facial oil. Then I saw the bath soaks and knew I had to try one of those as well. Considering the product quality and how luxurious the packaging looks, I was pleasantly surprised to see that Herbivore comes in at a great price point for skincare. The creams came in at between £40 - £50 each, and thanks to the choice of sizes in face oils I was able to buy the 8ml size for £24 to try. The bath soak came in at £16 for the smaller jar. I didn't commit to bigger sizes as I like to try things for a little while, and I loved that there were a range of sizes to choose from. Can we just take a quick second to talk about packaging? I know it really isn't important in the long run, as the products need to stand out on their own, but we buy with our eyes first, and Herbivore Botanicals obviously know this. Think minimalist glass jars with enough weight in them to let you know that they're good quality. Labels that remind me of brands like Byredo and Clean Reserve. There's nothing in your face, yet it screams luxury to me. Basically, they're just really lovely products to look at. Okay on the the actual products themselves. I bought the Pink Cloud Rosewater Moisture Cream, the Moonfruit Superfruit Night Treatment, the Phoenix Regenerating Facial Oil and the Coconut Milk Bath Soak. I've been using all four for a few weeks now, and am loving most things about all of them. The Pink Cloud Rosewater Moisture Cream has to be my favourite product. I've never come across a day cream with the same kind of mousse texture, almost as if it's been whipped. It feels super lightweight on the skin, and leaves a dewy glow which looks lovely under makeup. My skin can be quite blotchy and red at times, and I definitely think this has helped. My skin looks more even and has less visible dark spots during the day. The cream is a lovely shade of pale pink and has the slightest rose scent which makes it gorgeous to put on in the morning. I was a little sceptical of the Moonfruit Superfruit Night Treatment, as the colour (bright blue) and smell (lavender - my least favourite) made it seem a little gimmicky to me. I mean, does it really need to be blue? Won't it break me out? In my past skincare experiences, heavily fragranced products really haven't agreed with me at all, so I was a little cautious when trying this out at night time. However, I had absolutely no trouble with this product at all, which I'm assuming is because everything is natural, scent and colour included. In fact, the Night Treatment has left my skin feeling smooth and fresh every night, and I've been waking up in the morning with fewer blemishes and plumper skin. The blue colour dissipates on application, leaving my skin slightly mattified - something I didn't expect at all. This might be thanks again to the texture of the product. Instead of the whipped, mousse-like feel of the day cream, the night treatment is almost like a soft clay. Both products work really well together and are on my repurchase list. When it comes to facial oils I'm never a fan, purely because I hate the feeling of oil on my skin. I'm one of those people on holiday who moans every time I have to put on suncream because I hate the texture. So it was with gritted teeth that I tried out Herbivore's facial oil. There were a few different options offering things like 'Youth Preserving', 'Balancing' and 'Regenerating'. To be honest they all sounded amazing, but given my hate for oils I decided one would be my best bet for now, and went for the Phoenix Regenerating Facial Oil, which promised to radically rehydrate my dry skin. I have to say, as much as I really really hate touching it, it is doing it's job and I've been throwing the stuff on like I'm never going to have it again. I apply the face oil after the Night Treatment, and it leaves my skin silky smooth and soft. Don't apply this before the Night Treatment, as it can cause the blue cream to gather and stick. It takes a while to sink in, but warmed up in my hands and gently pressed into my face I definitely notice a difference the next morning. As I've hit my mid twenties, I've been more attracted to products which will help slow down the ageing process into my thirties, when the skin sees dramatic changes. 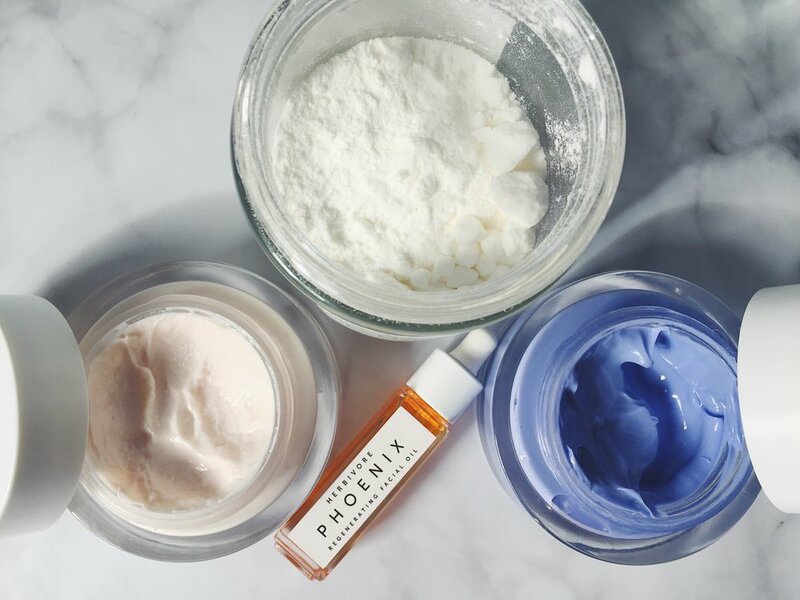 The Phoenix Oil is one I'm going to be using for the foreseeable future, as its preventing of premature ageing and super hydration ticks every box for me. I'll just have to get used to the texture. Sigh. All in all, I'm so so happy that I found Herbivore Botanicals. Thanks to the all natural products my skin is feeling better than ever, with fewer breakouts, and a plumper, smoother feel. My makeup goes on in the morning like a dream, and I don't look super blotchy anymore! I've got my eye on a few more products from the range (the Lip Conditioner and Rose Hibiscus Hydrating Face Mist especially), and will have to put another order in to Space NK when I run out of my new favourite moisturiser. Who knew that buying all-natural would make such a difference!